As part of the Costa Rican exchange, after our visit to Costa Rica agricultural sites this past February, the Ticos are now visiting Iowa and it is our turn to reciprocate for the warm welcome we received. 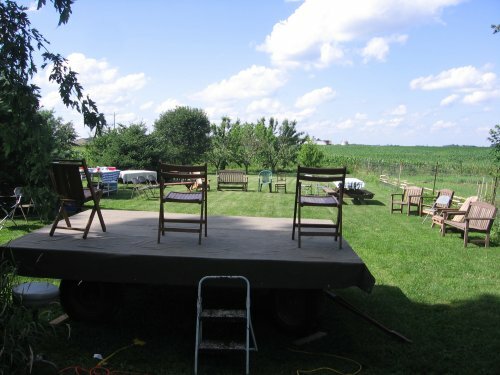 The stage is set for dinner and dancingÂ – it turned out to be a perfect July evening – in the 70’s with a dry north breeze. Here’s the group that is visting Iowa. Four of the members of the group we met in Costa Rica, the others are new to us. 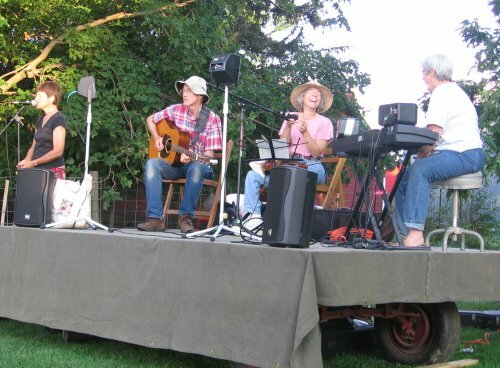 Here “Lonna and the Pretty Good Band” start the evening off right after a dinner of iowa sweet corn, watermelon, hot dogs, rice and beans, and strawberry, apple, and cherry crisps and cobblers from fruit from the farm. 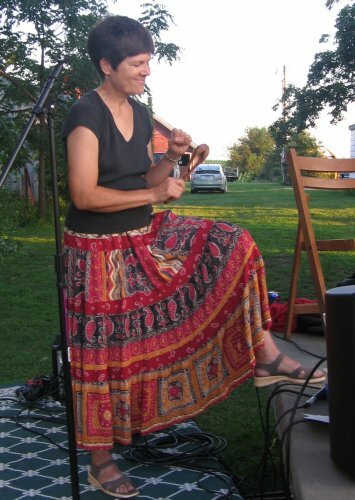 Lonna, the caller, started us out easy in a circle dance. 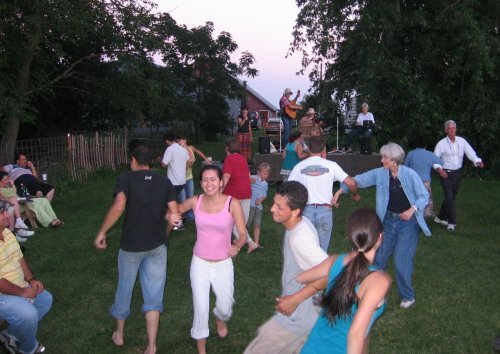 Despite the language barrier for some dancers, they would quickly catch on the the steps and as music and dancing are a universal language, there was much laughter and levity. Whoo! The circle comes together! 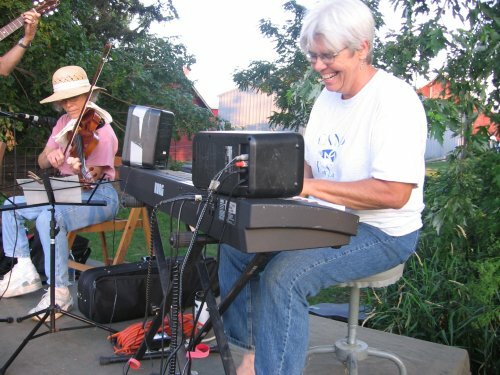 Annie, our neighborhood piano tuner and musician arranged the band for us. Lonna did the calling for the dancers. Heel to toe and ’round again. 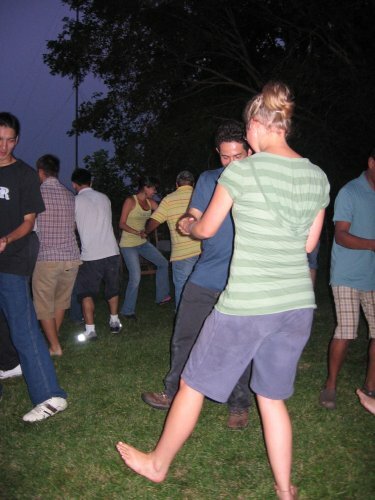 Emma kicks off her shoes and enjoys a dance. Martin was very popular with the ladies and danced every dance in good form. 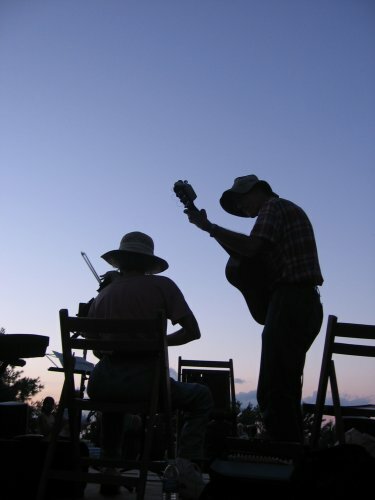 As the band played into the evening, the shadows fell as the music went on. For those of you with Windows Media Player and Internet Explorer, you can click the icon above to see 15 seconds of the dancing with Ticos, complete with music! All told, we were 10 days in Costa Rica. 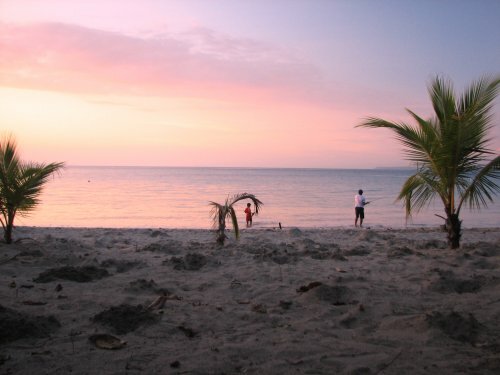 We stayed in San Jose for six nights, Liberia for two nights, and Punta Leona for a night. These are our digs in San Jose. 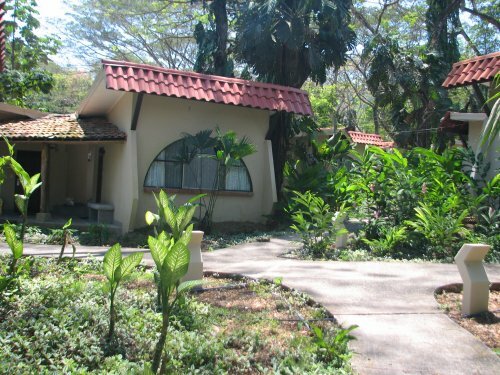 It is tucked in a corner of the University of Costa Rica and had a nice grounds and exterior and functional rooms. Most of the time we had hot water! The place also had nice gathering spaces where many people could sit and chat if they didn’t want to be in their room. I wouldn’t mark down San Jose as a “can’t miss” tourist attraction. 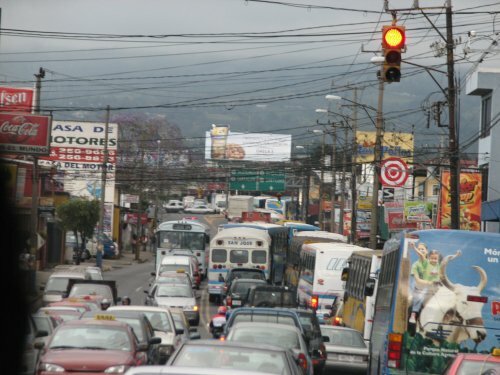 It’s a city of one million plus with european size street and american style traffic. Most of the homes were gated and even had razor wire on top of the gates. I would not consider driving a car there. Most of the streets are unmarked/unnamed and driving takes different skills than U.S. drivers possess. 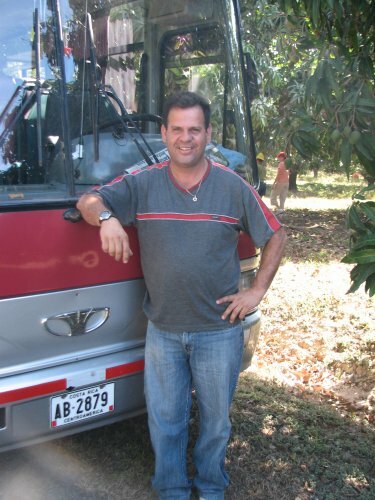 Here is Javier, the “most valuable” player of the trip, our bus driver. He negotiated both city driving and country driving with reliability. Out in the country, the roads seemed to be about as wide as a driveway, with no line markings, and equal numbers of buses, cars, motorcycles, bicycles and pedestrians and no shoulders. Up in the mountains we saw semi-tractors backing down the road because they couldn’t make it up the steep road. We had one particularly harrowing night in the fog on a winding road up a mountain when numerous semi trailers were dead on the road without lights or caution markers, often times right after a sharp curve. Through it all, we felt safe with Javier at the helm! 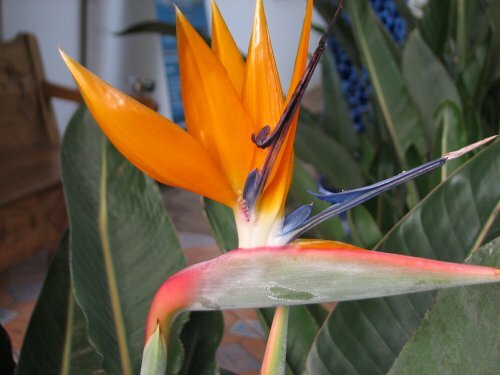 I’ll leave you not with urban sprawl and bad roads, but a bird of paradise flower which are common throughout the country. Shortly after I got home, I realized that if I wanted to, I could probably retire tomorrow and move to Costa Rica and live the rest of my life without having to add any more to the retirement account! One of the days we were walking out in a rural area, I think either after the visit to Alvero’s farm or the strawberry farm and commented how there are many worse lives than spending your time tending crops and animals with your family, without all the conveniences of modern life (dishwashers that don’t drain, for the most recent example from our home!). So, that’s all from Costa Rica for now. 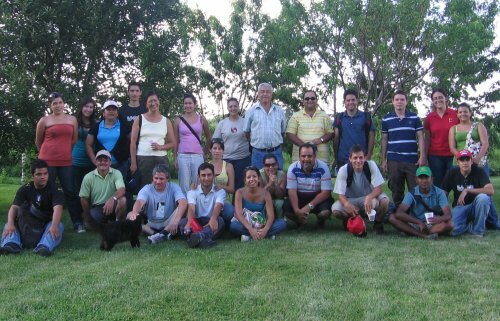 We look forward to the Ticos who will come visit Iowa this coming July from Costa Rica! At the end of the trip, we had about 20 hours at a place on the beach (Pacific side). 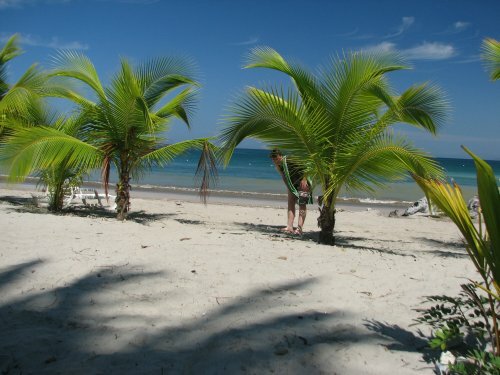 This woman’s Midwestern modesty cannot coax her out from behind the palm tree! Later in the day, some folks tried their hand at fishing and were not successful. 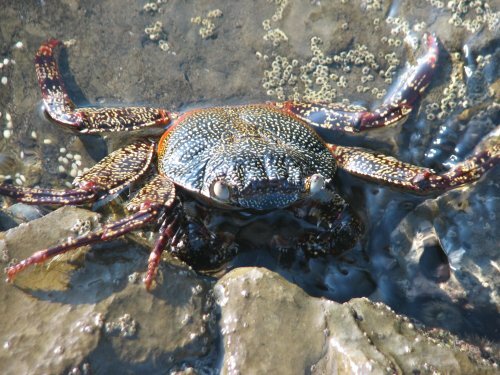 There were some rocky stretches as well where we could explore the tidal zones and all the fun creatures living there. Here’s our lodging. Say, don’t those plants in the foreground look like the houseplants that never look quite right? 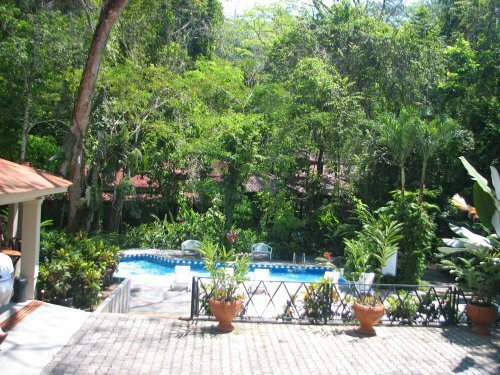 Behind the pool and nestled in the trees is one of the restaurants at the resort. The literature claims no trees were felled to construct the buildings – many had trees growing through them. Most of the restaurants where we dined were open air and bugs/flies were surprisingly never a problem. The resort had a number of trails through a forest. 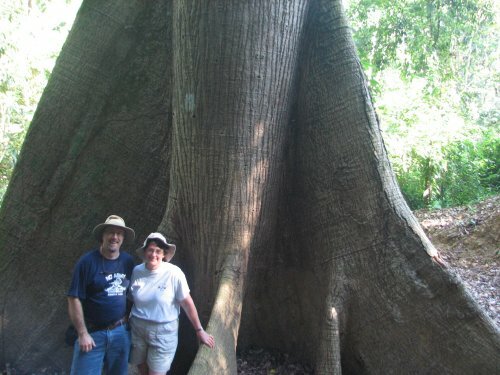 Here is the base of a giant tree. This one had a zip line way up that you could speed above the rain forest canopy. 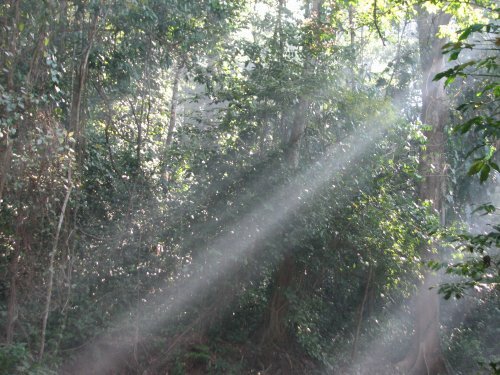 Martin, our resident rain forest expert said this picture had too much light to be a rain forest because rain forests only get 2% of the light down to the ground and this photo was more than 2%. 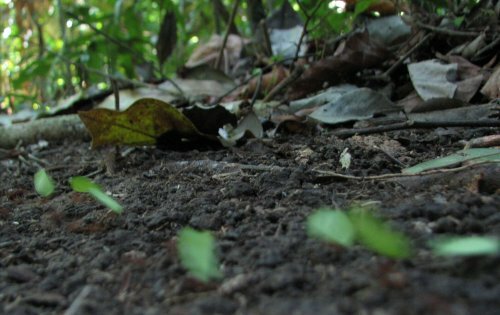 One of the most fascinating parts of the hike was coming across colonies of leaf-cutting ants. This particular group was disassembling a fallen flower. 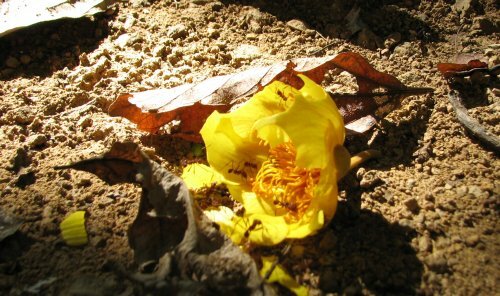 It was a treat to see a long line of ants, each carryingÂ a piece of this flower back to the nest. These ants were carrying bits of leaves. Unfortunately, the dark conditions and difficulty of close-up focus without a macro lens made photos problematic. I could say the ants were moving so fast, they were a blur, but that wasn’t the case. Here’s a “Where’s Waldo” challenge for you. Here’s one of the few photos of the two of us together on the trip. This melon farm was on a floodplain adjacent to a river. Across the river (which isn’t visible in this photo) is a national park. It was a stunning place for a farm field. 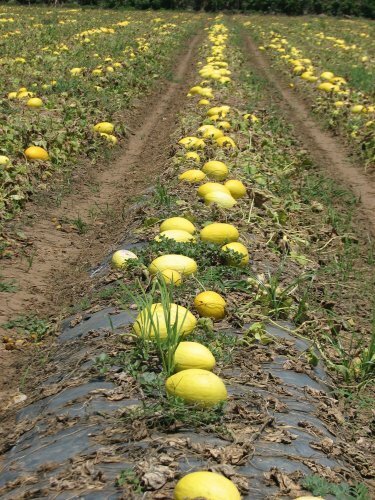 These melons are ready for harvest. This farm needs five melons per square meter to be profitable. 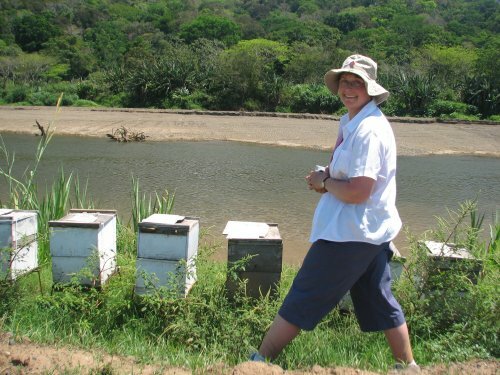 The farm had a number of beehives for pollination. 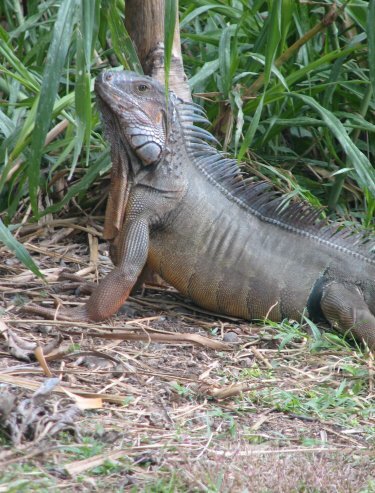 The river had a number of large mean reptiles up to 15 feet long that make it not such a good place to swim. The melons all loaded in the wagon and hauled to the packing house. The side of the wagon is tilted down and the melons tumble into a light chlorine bath. The first round of hand sorting as the melons float by. The melons are packed and sold according to size (how many fit in a box). 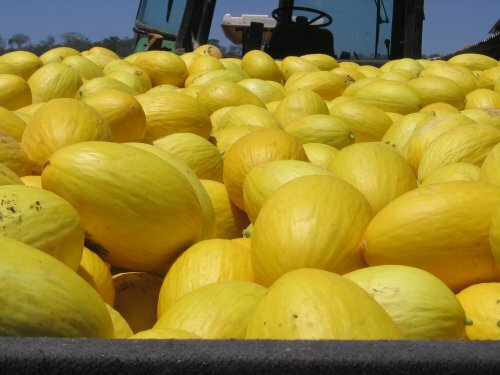 These were labeled “Honeydew” melons destined for Europe, even though they looked like squash, they tasted like a honeydew melon. 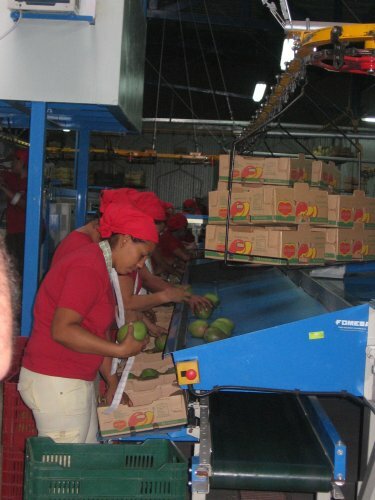 The first stop this day was at a mango farm and packing plant. 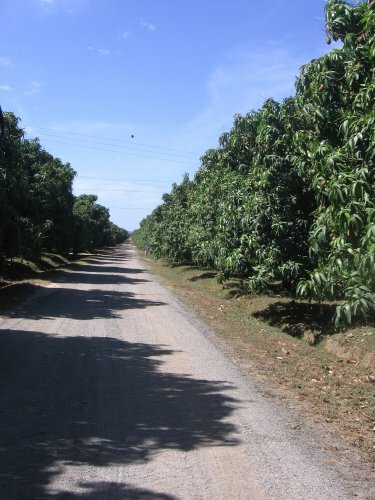 Again, this was a large expanse of mangoes, several hundreds of acres. Some mangoes hanging on the tree. The perimeter of the orchard is lined with this wall of recycled plastic to protect the orchard from wind. 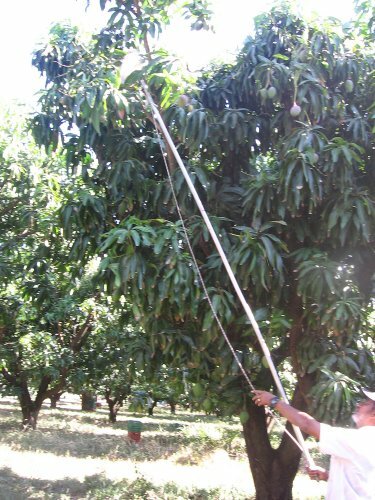 The mangoes that cannot be harvested by hand are harvested one at a time in this tool that has a snippers and bag to catch the cut mango. The freshly cut mangoes extrude a milky liquid that is irritable to skin. 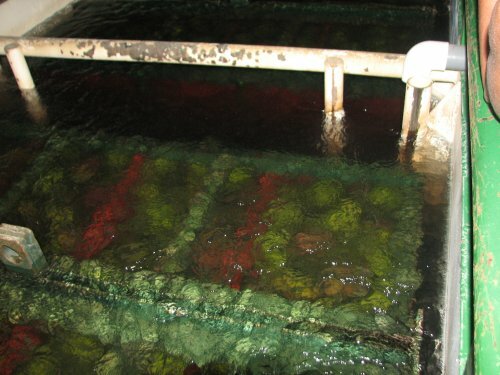 Workers turn the mangoes stem side down on metal grates for a half hour to let the liquid drain before further handling. 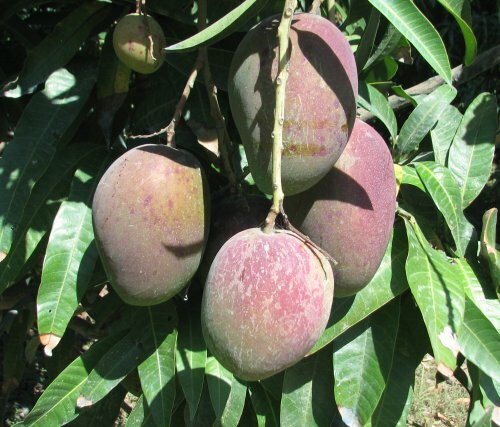 We were able to find some irregular mangoes that were not harvested for sampling. 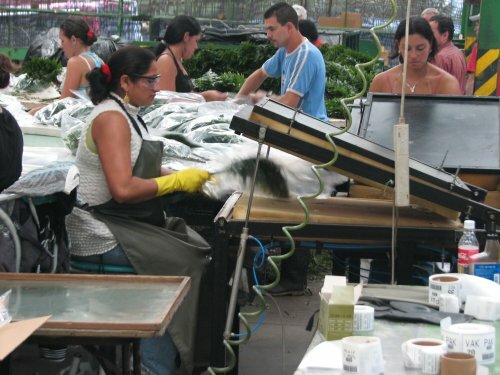 Uniformity and consistency is very important for the export market. 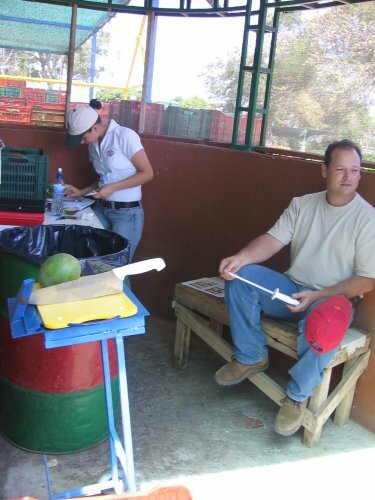 At the loading dock are a couple of government inspectors looking for fruit infected with pests. Again, on the cutting board is the machete. 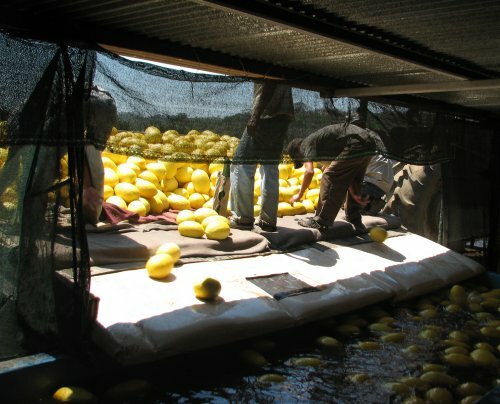 The workers dump to mangoes from the field crates into the waterway that leads to the plant. You can see the crate in mid-air thrown from one worker to another. 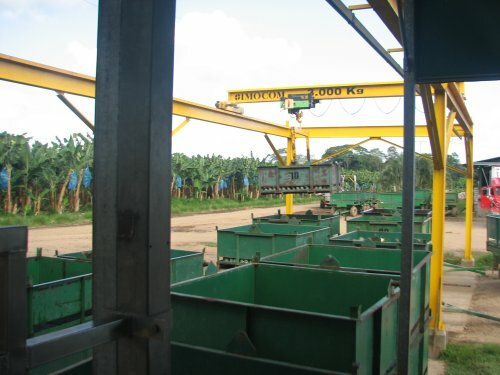 The first hand sort separates the mangoes to be further processed with those going back out (on top conveyor belt) for other uses. 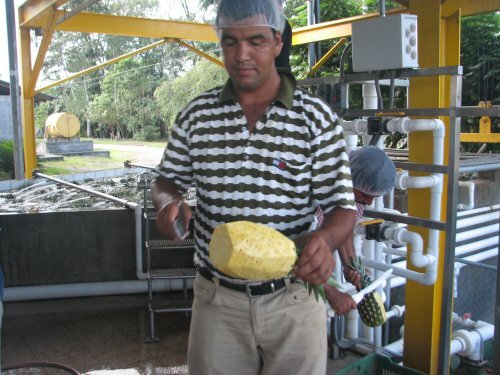 After the initial sort, the mangoes float through a fungicide bath. An automated sorting track is the next step. 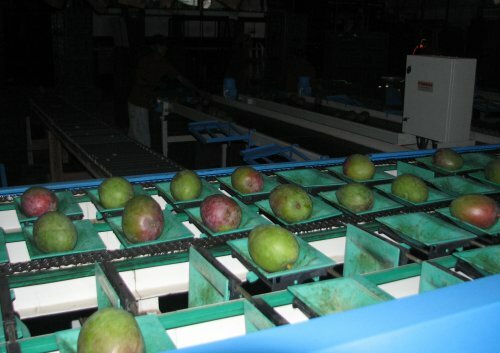 The trays tip at various locations based on the weight of the mangoes. 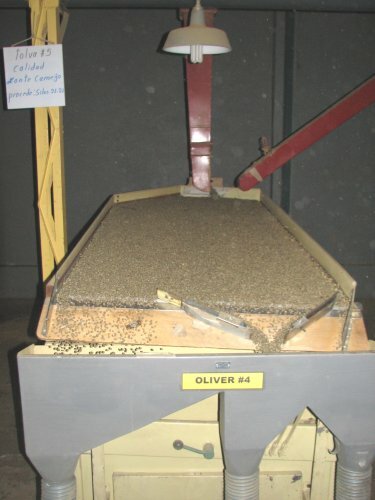 A number of conveyor belts are arranged perpendicular from this sorter for further packing and sorting. 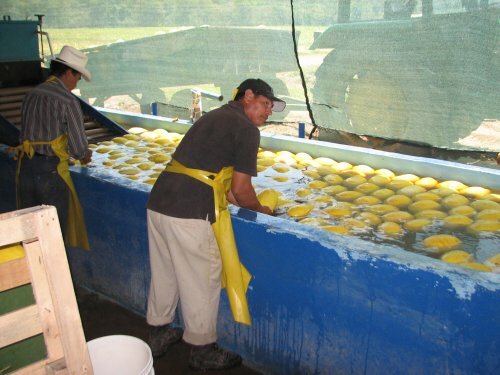 Another treatment is to dump the mangoes in 105 degree water for 15-17 minutes for additional pest control. 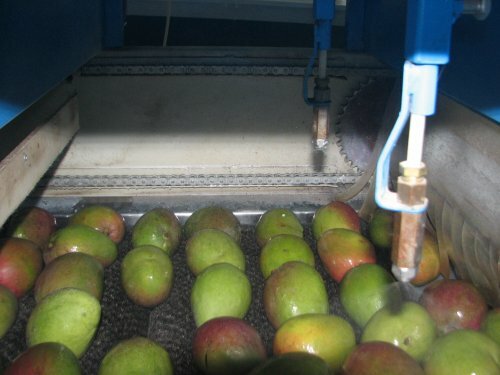 A spray of wax is applied to the mangoes. There is one final packing by size. 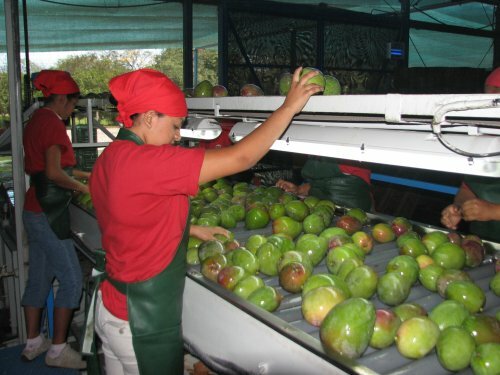 Notice the packers with the rolls of stickers that they apply to the fruit – those are the stickers that you find on fruit in the stores. In the afternoon we visited a large fish farm where photos were not allowed. 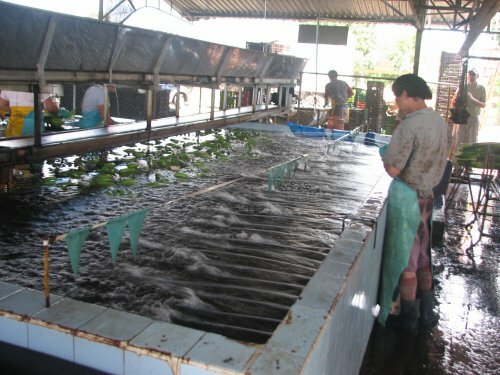 We visited acres of ponds and toured the processing plants where my favorite new euphemism was the “relaxation chamber” where the tilapia first enter the plant. They come in as wiggling fish and leave as frozen fillets. 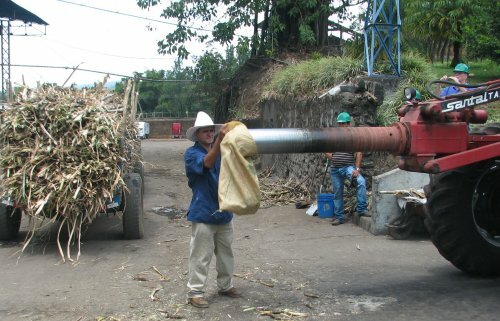 Sugar cane day was one of the most interesting days of the trip. 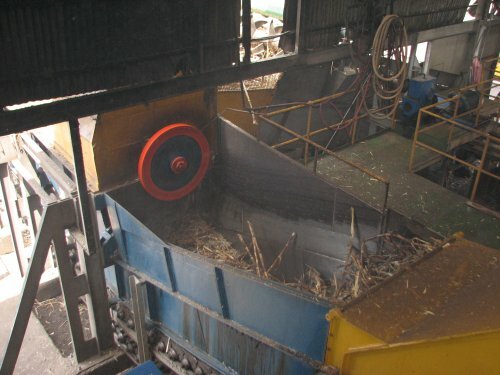 They used to burn the canes before harvesting, but at this farm, they use this giant chopping machine. 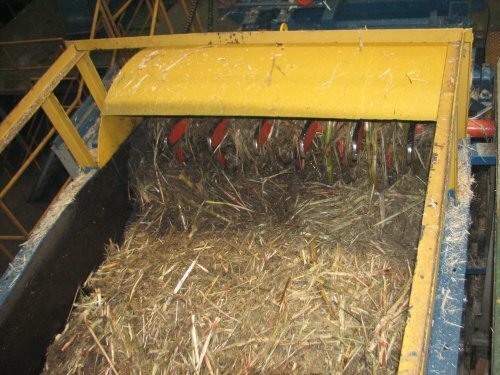 It has a chopper arm that stays about 6 feet above the ground to chop off the top of the canes, and a chopper on the bottom that cuts the canes near the ground and sends them through the machine to chop into 6 inch pieces. 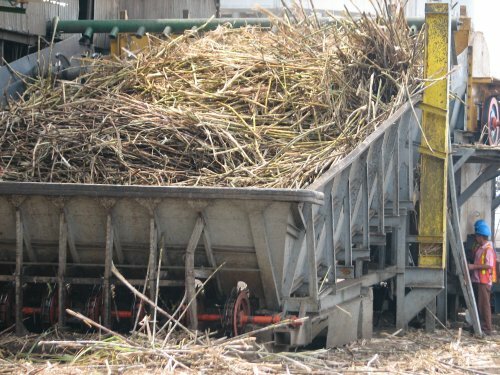 There is still much sugar can harvested by hand. This was the only machine like this in this part of the country. 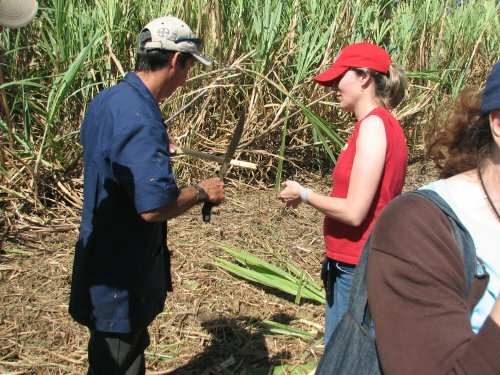 One of the workers grabs a machete and opens up some cane for us to taste. It was really quite sweet and fibrous. Next we visited a sugar mill. This mill is a co-op that has been in existence since the ’40s. 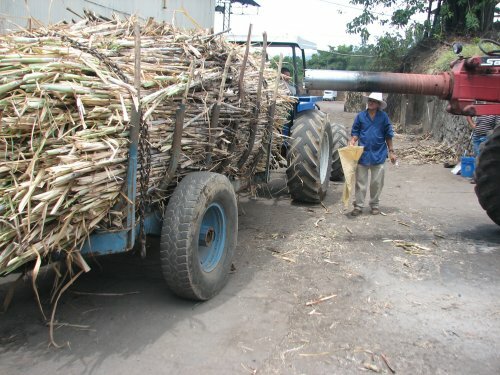 Here a farmer comes to the mill with a load of sugar cane. 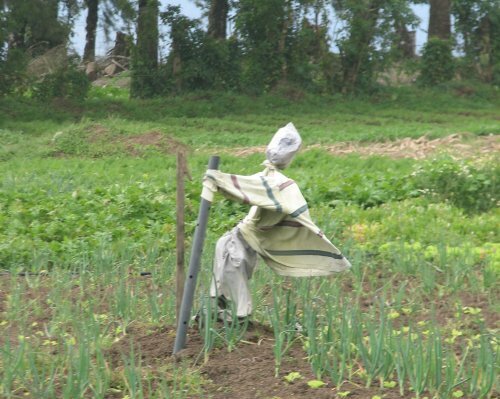 Farmers are paid on the weight and quality of the canes. 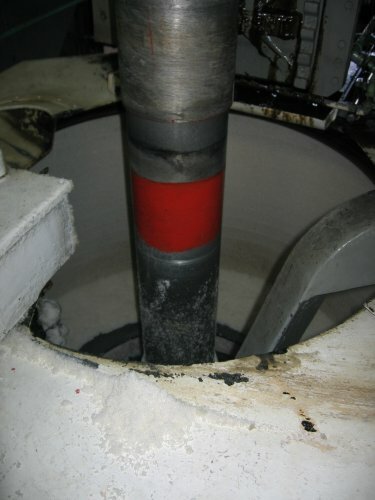 This machine drills into the load and retrieves a sample. 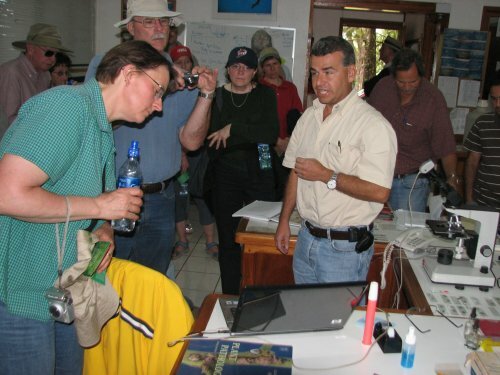 The sample is collected and brought to an onsite lab for evaluation and ultimate payment to the farmer. 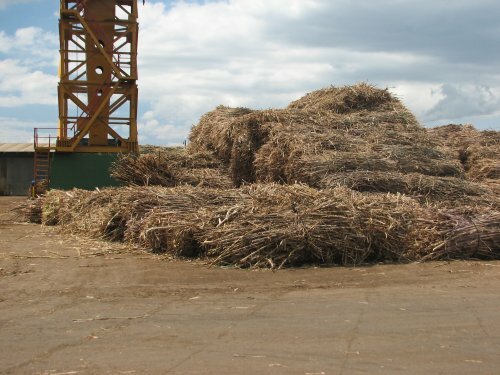 The canes are stored in piles awaiting processing. 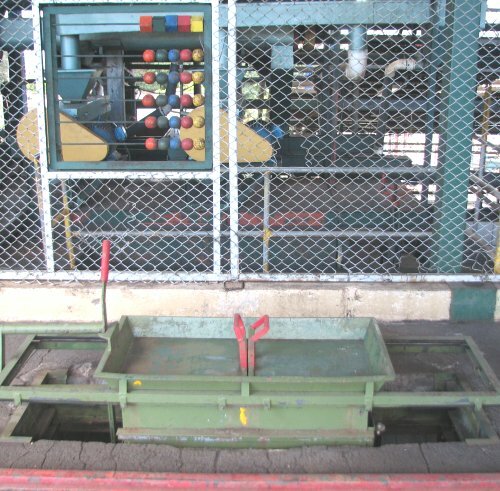 The first step is to load the canes into this giant conveyor. When the bundles are dropped by the crane, a guy runs out on top of the moving canes and unhooks the chains holding the bundles. 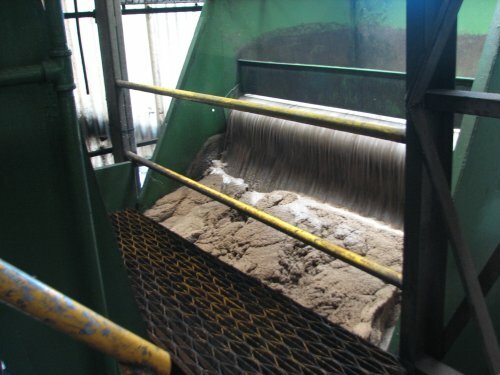 The first step inside the mill is this giant chopper. 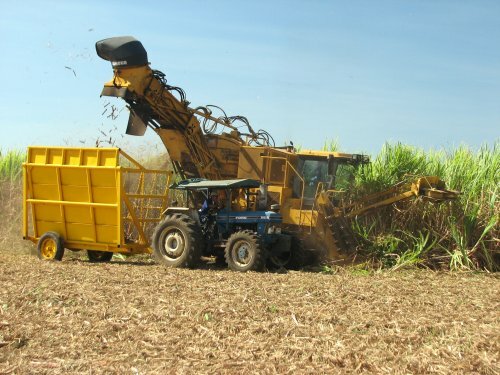 A secondary chopper further reduces the cane. The whole series of choppers follows down this line. 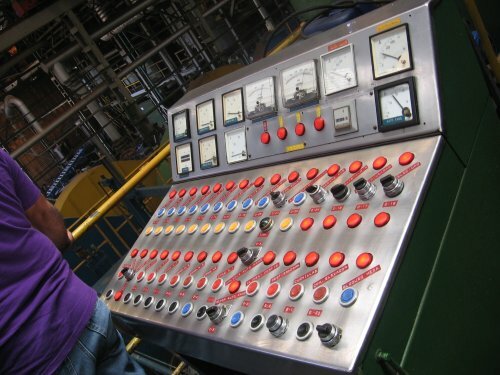 Looks like solid state technology on the control panel! 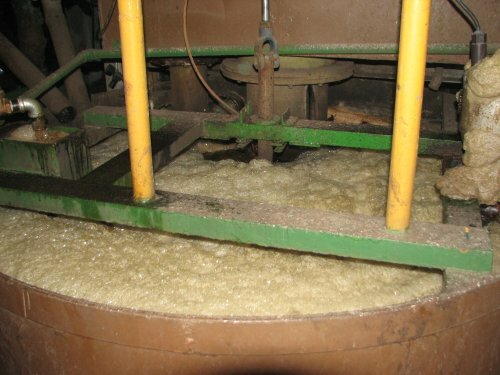 Finally, the sugar is separated and liquefied and brought to a new part of the mill. Large vats of bubbling liquid are part of the next steps. It felt a little like going into a Willy Wonka factory gone bad. 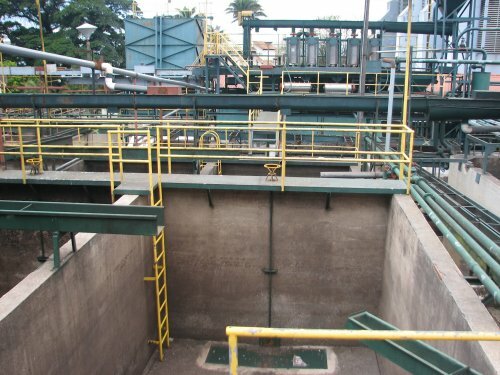 There were all kinds of open vats, exposed belts and gears, narrow walkways over chopping conveyor belts, steam escaping everywhere, open augers and spinning centrifuges. To top it off, we didn’t even have to remove our jewelry and rings! 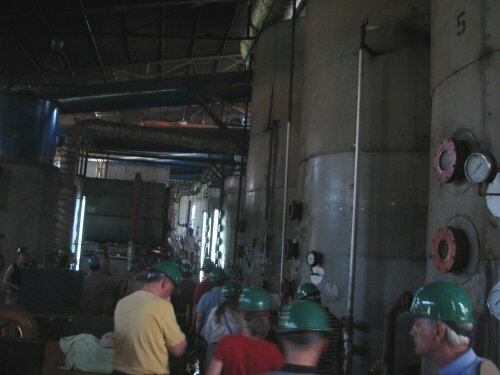 Part of the mysterious part of the plant – large vats of heated and pressurized sugar. We couldn’t hear a thing throughout the tour. A place where the process is checked by sampling the product. 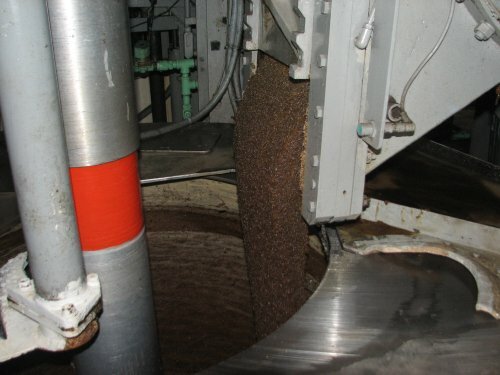 Finally, a brown slurry come out and into a spinning centrifuge. About 90 seconds in the centrifuge turns the sugar white and crystalline. 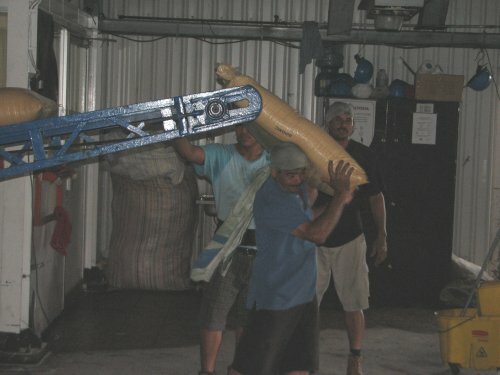 At the end of the line, Nicaraguans take the 120 lb bags off a conveyor belt and load them onto a truck. 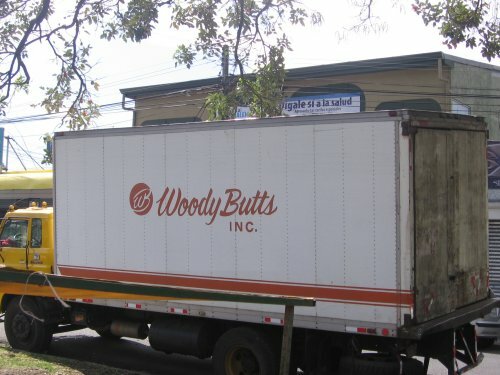 The truck outside being loaded. We weren’t too sure what they had against pallets and forktrucks. At the next stop, these bags will also have to be unloaded by hand as well, but it will be much harder to reach down and lift them. The first stop today was at a fern farm. 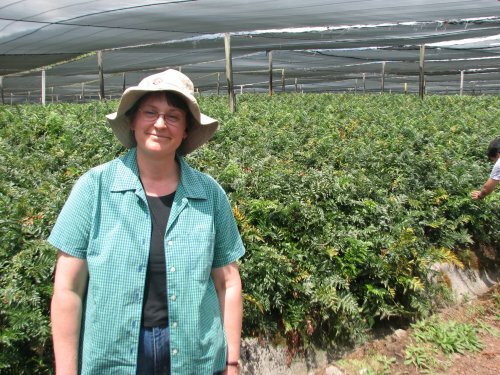 It is one of the largest fern farms in the world. 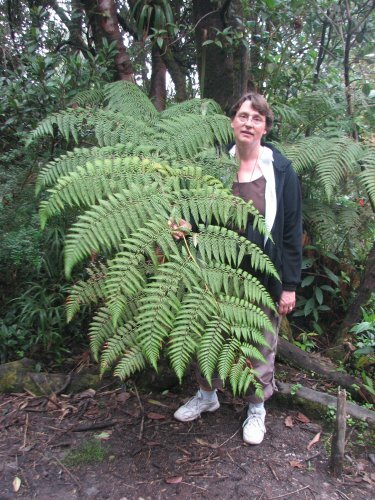 The ferns are background for flower bouquets – the stuff that’s left weeks after the roses die! 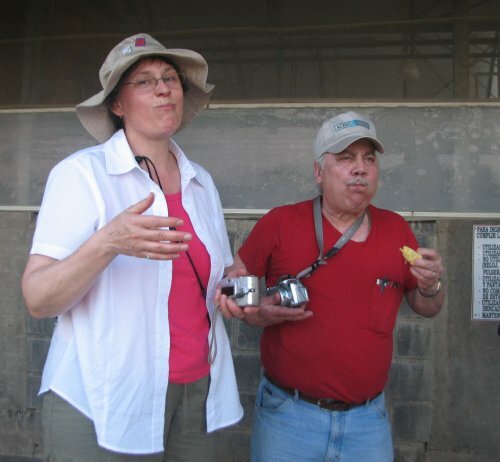 The farm has a lab that has done extensive research on fern diseases and they do some top-notch research here. 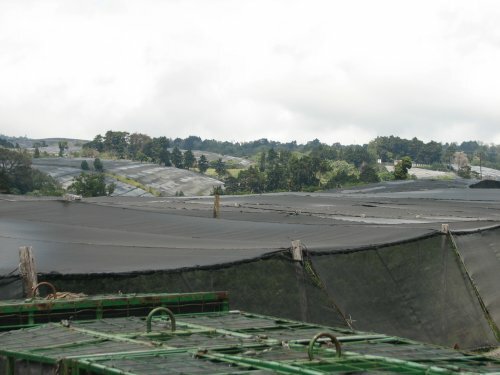 The fern farm covers acres of land covered in black shade cloth. The shade cloth is now 72% sun block. It was recently 66% sun block. 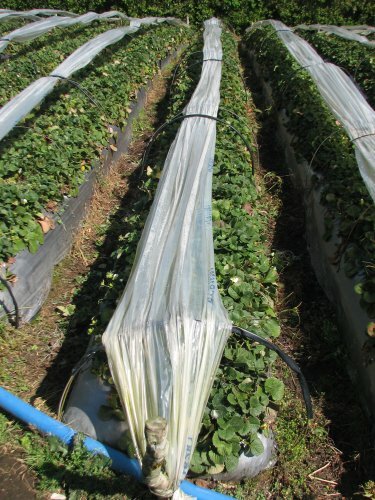 According to the farm operators, the intensity of the sun has increased over the past few years requiring thicker shade cloth. There is not an explanation. 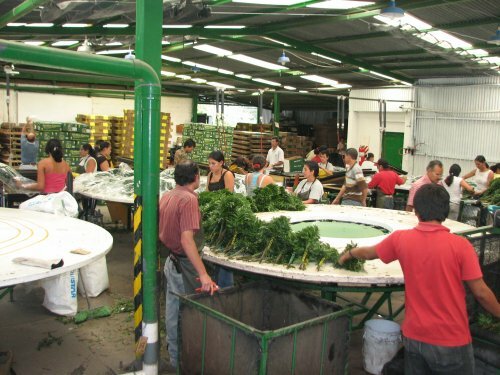 Inside the packing plant, the ferns come sorted by size in the field and come in for trimming, vacuum packing, and packing. 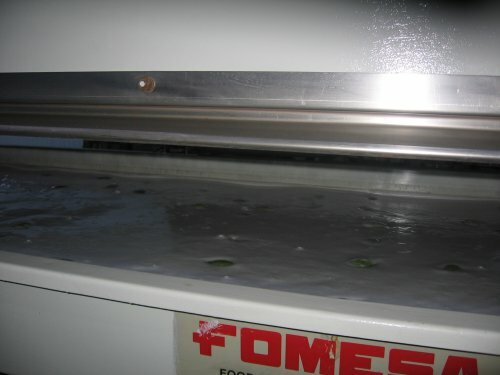 Here’s the machine that vacuum packs the ferns. The ferns are put into a bag and the table comes down, pushing out the air and sealing the edge, like a giant seal-a-meal. The ferns are then put into boxes and into refrigeration. These ferns were headed to Europe for Easter arrangements. They ship out about two shipping containers a day. 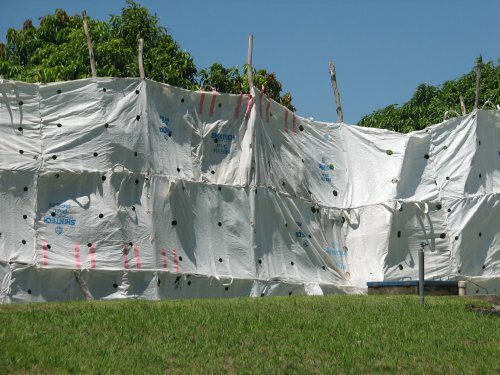 For this enterprise and others shipping to Europe, the GAP standards aim for pest and disease control with minimum hazard to workers, neighbors, consumers, and the environment. 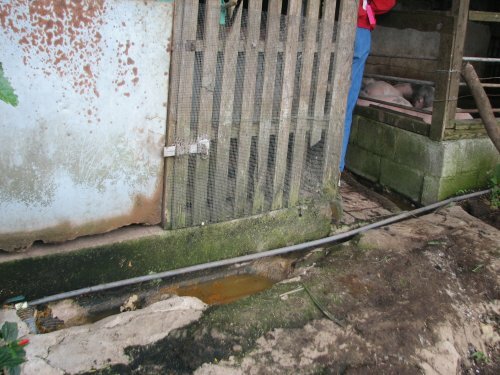 The standards require extensive record-keeping for compliance and they have frequent unannounced inspections. Up high in a strawberry field in a beautiful setting. 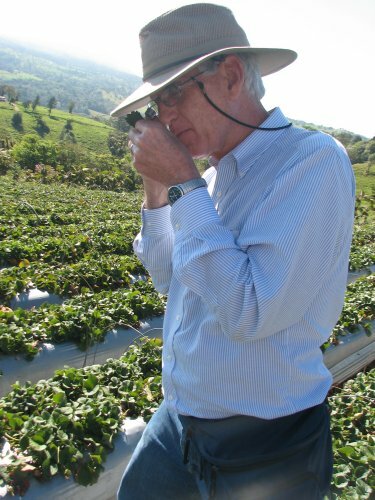 Here an entomologist gazes deep into a strawberry leaf. 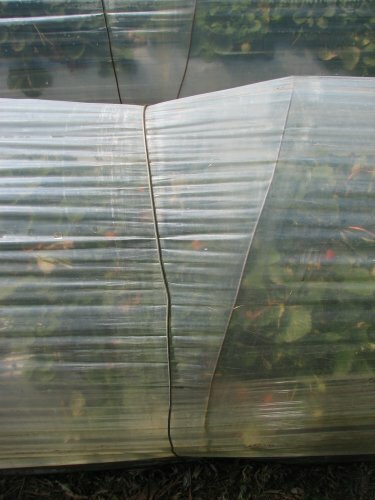 The covers over the berries have a simple plastic over and under adjacent wires. During the day, the plastic can be moved up or to the sides. We had a 20 minute walk to the fields that was not passable by bus. It was a very beautiful walk through the countryside. 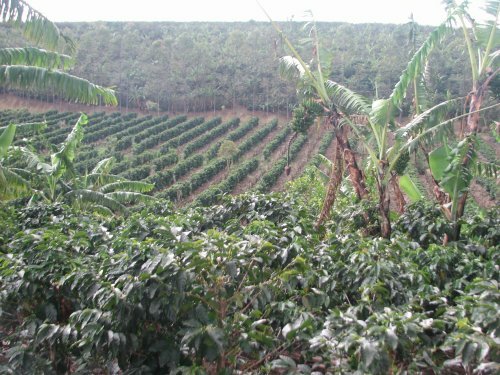 The last stop was at a coffee plantation where we received a tour a bit too cheesy for most of our tastes. I can’t remember the guide’s name, let’s call him “Fernando.” He had a booming voice and an aura of an afternoon Spanish soap opera leading man, invoking all the romance and care of the coffee bean! 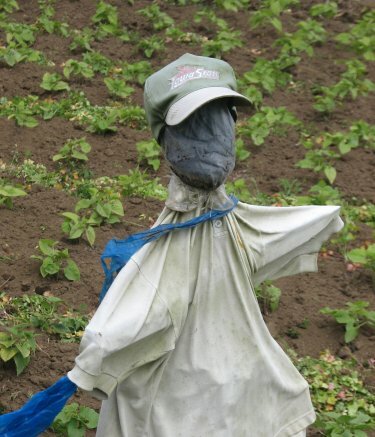 Here’s coffee out in the field. 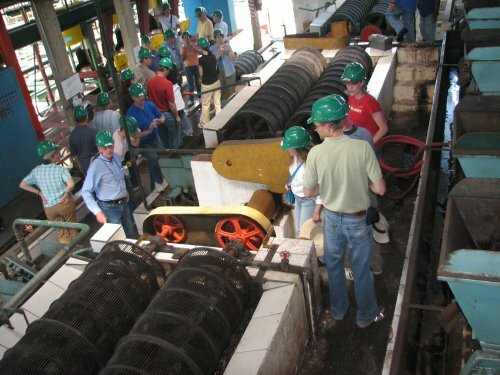 This is an old coffee mill that is part of the tour with some coffee out for drying. 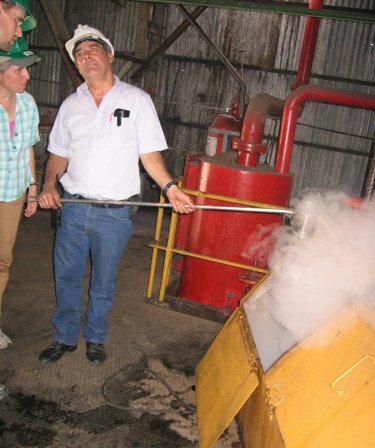 A few days later we went to a “real” coffee mill that was adjacent to the sugar cane mill. 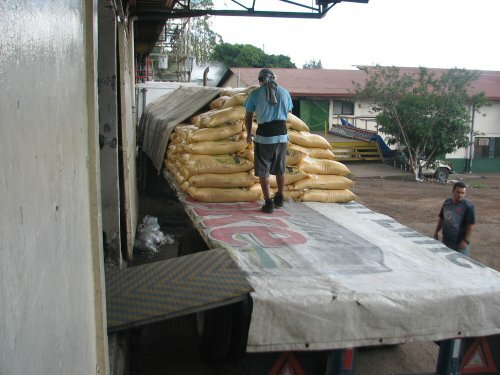 This is where the trucks back up to unload the coffee. Notice the high-tech abacus counter above the chute. One of the running jokes during the trip occurred at nearly every loading dock. Early in the trip, an employee was explaining in Spanish to us and talked a relatively long time. 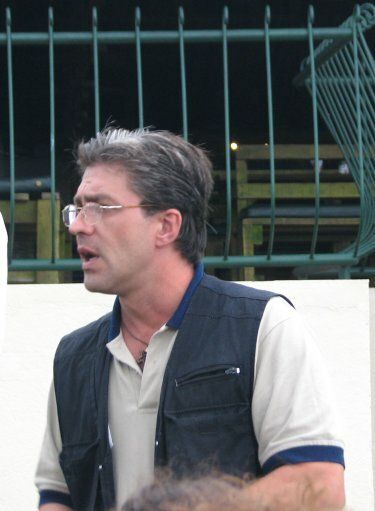 The interpreter simply said, “The trucks unload here” in explanation of a long-winded explanation. 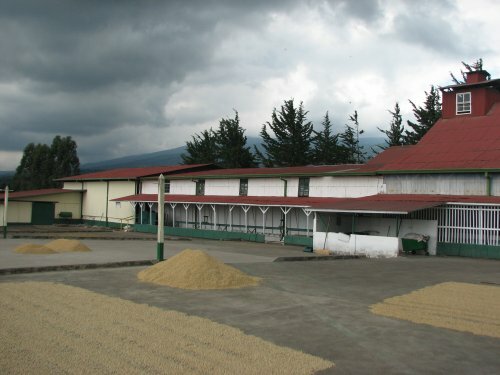 Coffee goes through many processes to remove the hull around the bean. 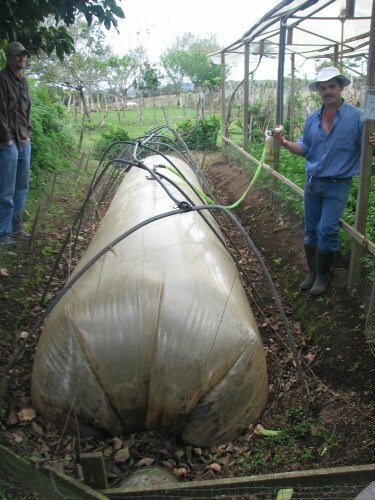 The coffee spends a fair amount of time soaking and fermenting in these big holding tanks. After the beans are dried, they are sorted on this shaker doo-hickey. 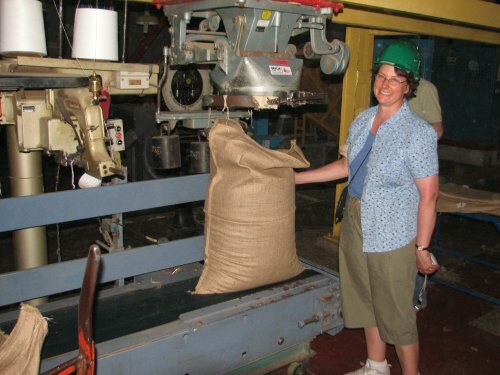 Finally, the beans are bagged and ready to be sent to the roaster. Have you seen a bigger smile on Linda’s face yet on this trip? We visited a couple of banana locations. 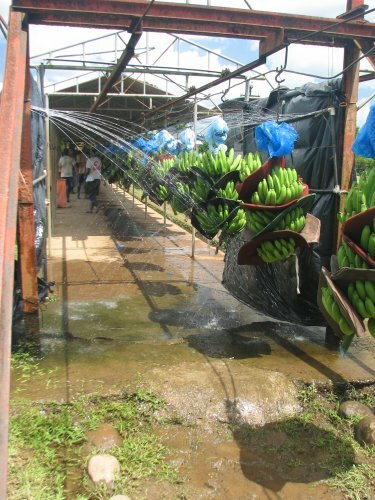 The first was a banana germplasm preservation center where they were growing many varieties of bananas to save and use for possible future breeding. The standard Cavendish banana for export teeters on extermination because of devastating disease problems. They have not yet been able to develop another variety that has the same shipping and taste qualities of the Cavendish. 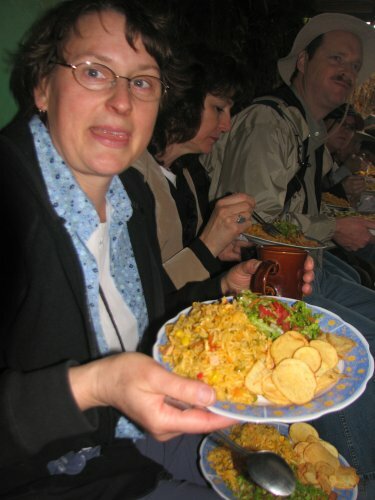 The Ticos eat another variety that does not ship well, but one with a superior taste. 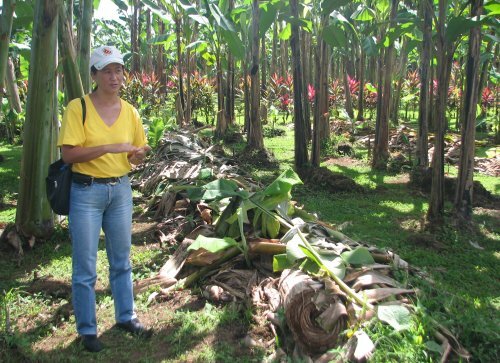 Amy explains some of the problems with banana culture here in the banana reserve. 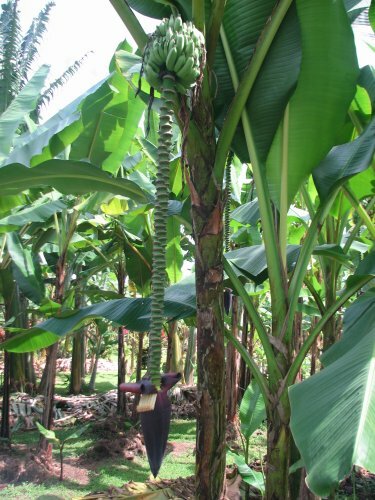 The banana tree grows its stalk and produces fruit in about a year. Then the stalk is cut off and a new one sprouts. The old brown stem in this photo has rings like a tree, but they are not like tree rings, more like leaves on a garlic plant. 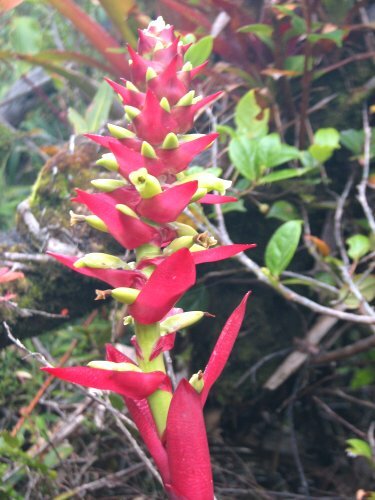 Here’s an example of a banana bunch with its deep red flower dangling below. 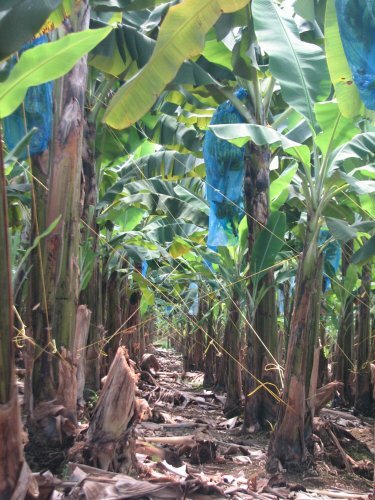 Now we are in a banana plantation of many hundreds of acres. 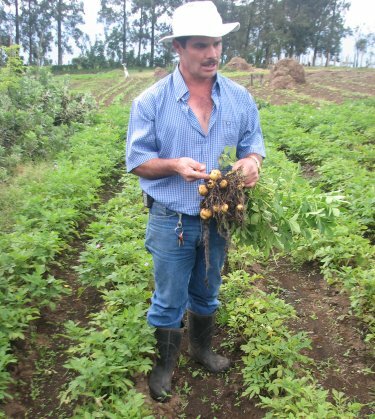 The yellow strings are used to support the stalks. 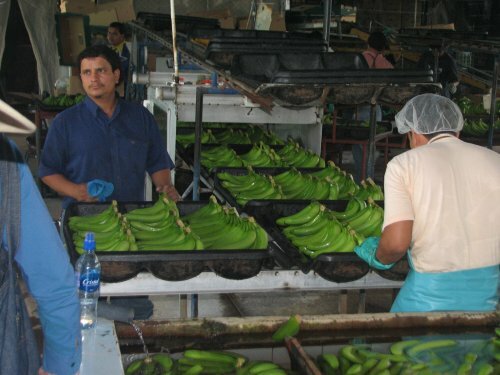 Migrant Nicaraguan workers walk through this maze and cut the ripe bunches and haul them through the maze to the banana monorail. 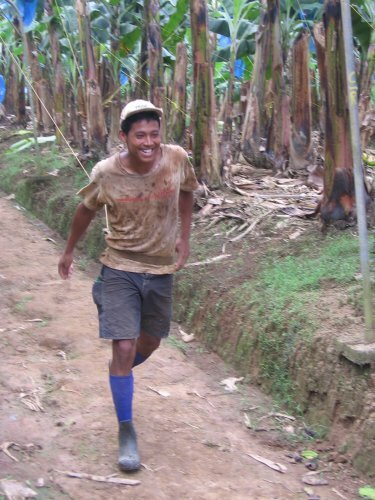 Here’s a young worker pulling a train of bananas down the monorail banana trail by hand. 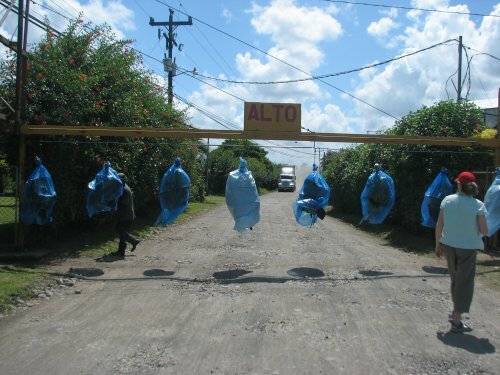 There is a trail that goes down the middle of the plantation about a kilometer and the workers put each bunch on a hook and pull them by hand down the monorail track. Here the monorail crosses a road as the banana puller crosses the main road with bunches of bananas. 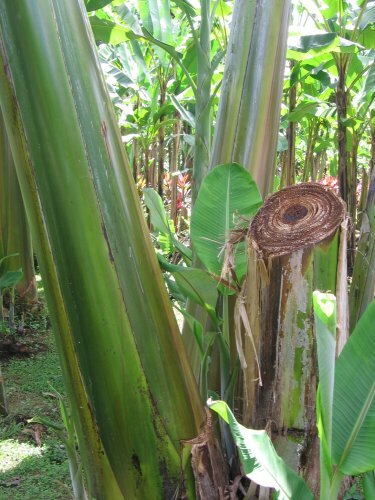 Bananas are very prone to insects and a plant fungus, black sigatoka. 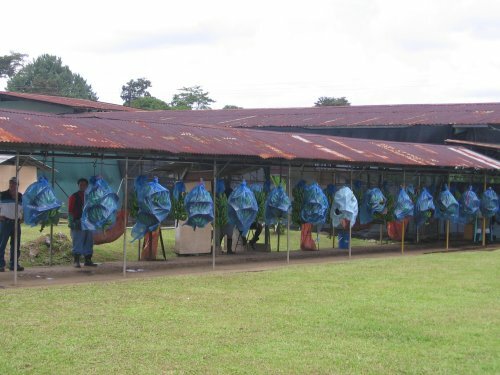 To control insects and sigatoka, the bananas here are aerial sprayed every week of the year, in addition to the blue bags containing insecticide. Here the bananas approach the packing shed. The first rinse, while the bananas are still on the monorail. The bunches usually weigh between 120 and 160 pounds. I wouldn’t want to weave through the jungle of yellow strings to carry them to the monorail! 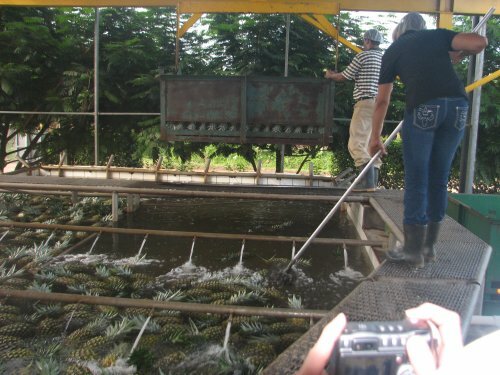 The bananas are put into a tank – this contains a light chlorine rinse if my memory is correct. 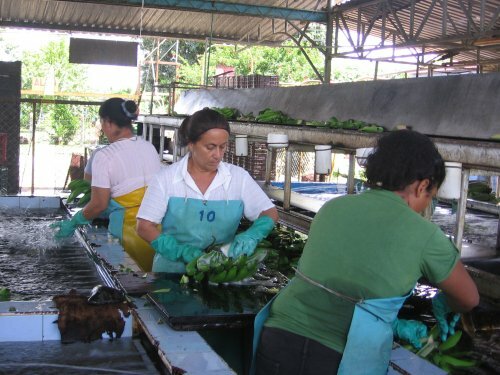 Next, workers cut the bunches into the bunches the size you see in the store. These ladies are very adept at using their knives. 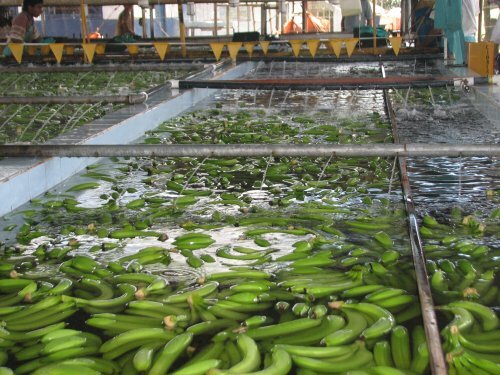 Bananas floating to the packers after getting cut into retail bunches. 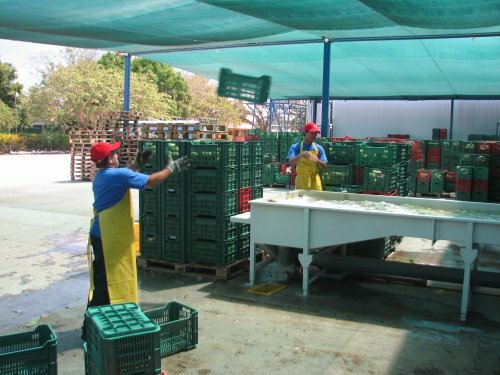 Packers put the bunches into trays before the bananas are sprayed with another fungicide to get ready for packing in boxes for shipment for export. We’ve now moved onto the pineapple fields. 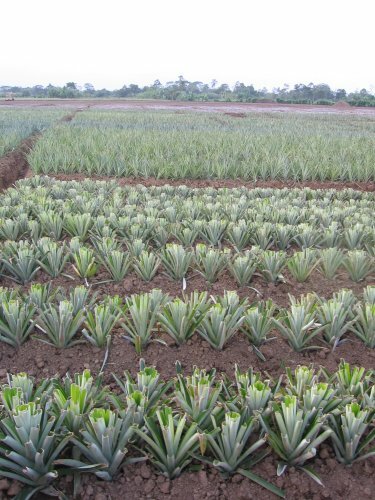 This is a field of newly planted pineapples. 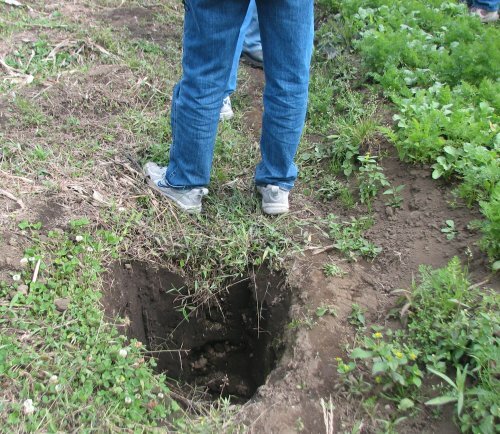 Pineapples require well-drained soil, so there are deep ditches for drainage every 50 feet for so. 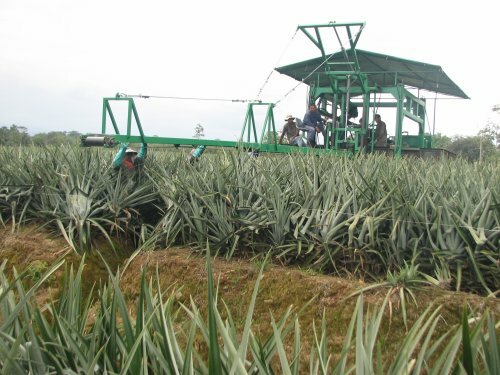 In the background you might be able to make out the earth-movers preparing the drainages for the next pineapples to be planted. The land is scraped, then backhoes dig the drainage channels, followed by bed shapers. 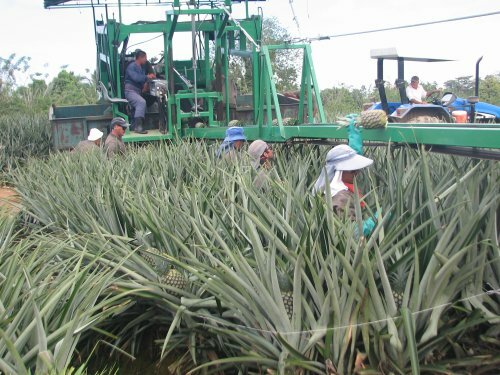 Here are more migrant workers harvesting pineapple. 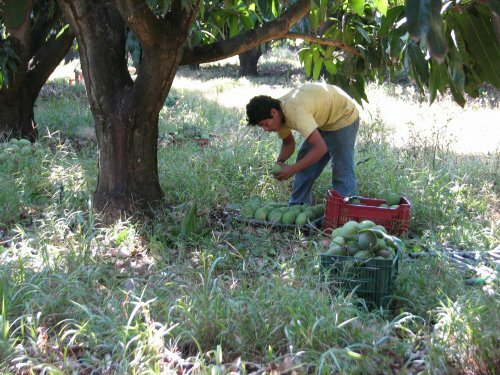 They walk through the field and put the fruits ready for harvest on the arm that comes out from the tractor/wagons. This is not a job I’d like. 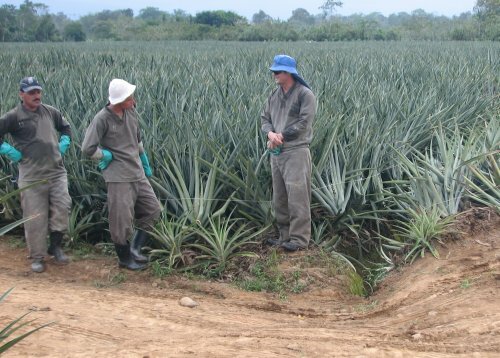 The pineapple leaves are hard and stiff, the workers need to wear full body protection and work in very hot and humid conditions. Here a worker catches an ride on the harvester boom to get across a drainage ditch. 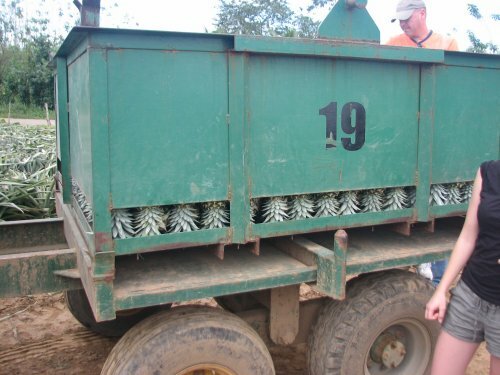 The pineapples packed inside the wagons. 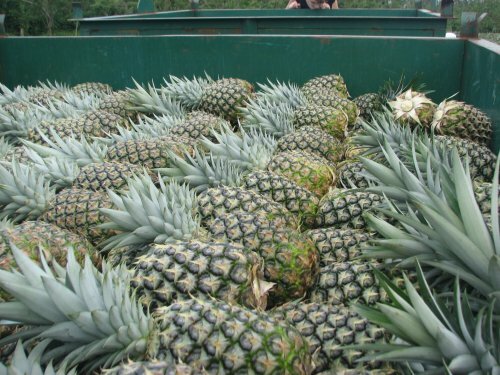 The exterior view of the wagons with the first layer of pineapples supported upside down so others can rest on top without damaging the crowns. 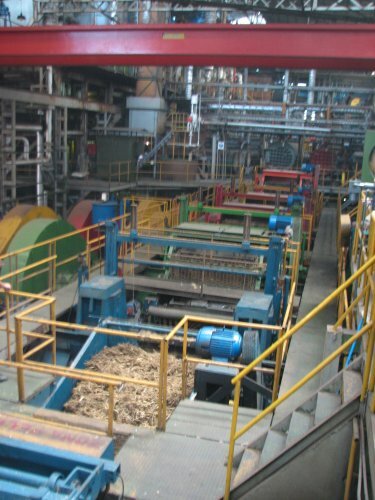 The wagons are brought to the plant for packing and picked up by a crane. The wagons are dumped into a chlorine water bath and moved towards the packing plant. 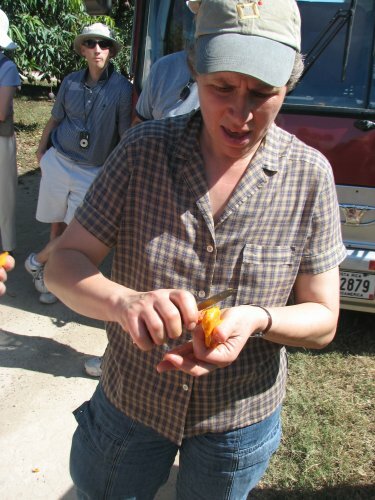 Here a worker finds a ripe pineapple and uses the ubiquitous machete to cut it up into pieces for sampling. This was the best fruit of the whole trip! 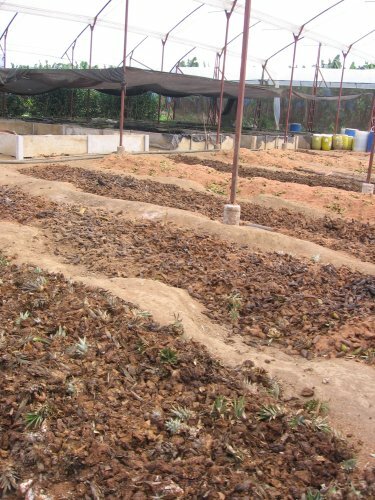 The plant is following the same composting regime as Alvero is on his organic farm and the plant has noticed better production on the areas where this compost is applied. Since most farms/factories are closed on Sunday, today was a less intense learning day. The Farmer’s Market was open, so we spent the morning there. 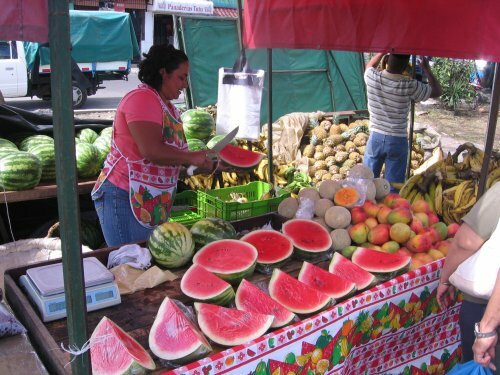 It seemed like it was about 10-12 blocks long – full of strange fruits and vegetables, noisy vendors, and people hawking lottery tickets like ticket scalpers. 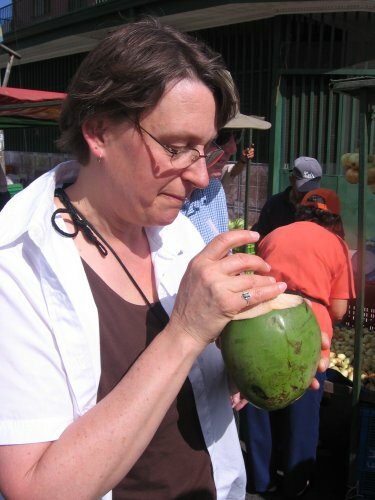 Linda tries some coconut milk straight out of the container. 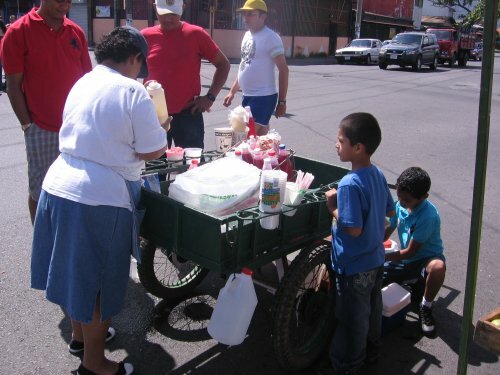 This vendor has a big block of ice and shaves off shreds and dumps in some fruit juice for a real icee. 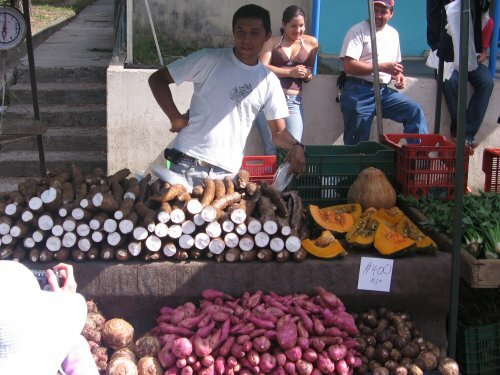 A vendor who specializes in root crops. 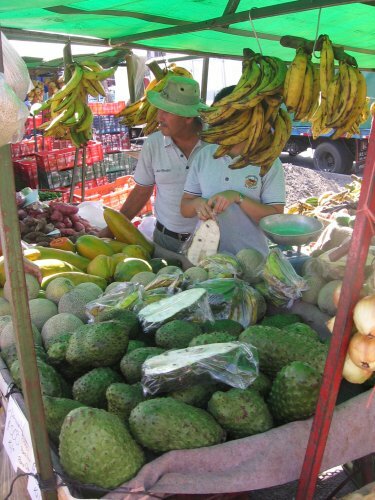 The green, spiny fruits are guanabanana – commonly used for flavoring in desserts and in juice. The watermelon from this booth was just fantastic. 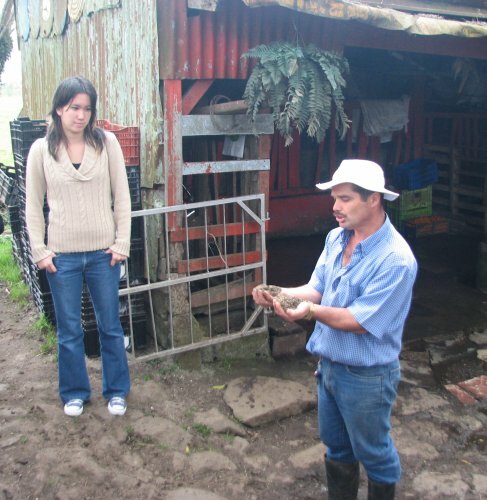 Ticos have different understanding about egg handling. 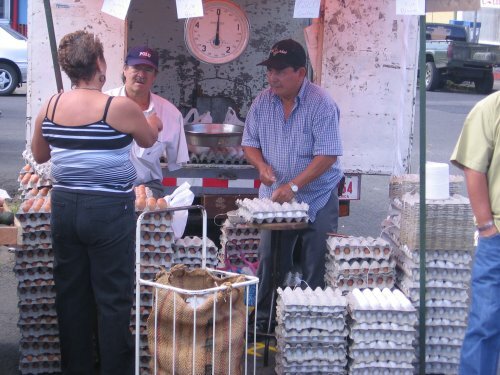 The eggs here and in the grocery stores were unrefrigerated and sold in two dozen quantities. 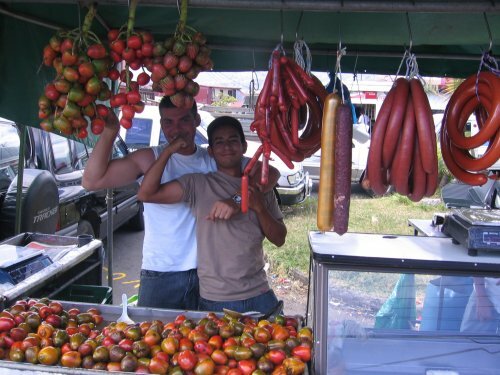 These boys at the meat booth were happy to show how strong they are! 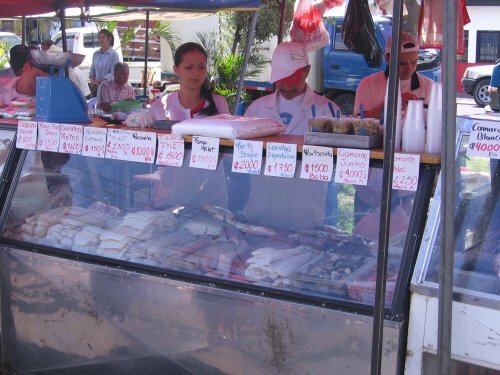 You could get fresh fish at the market. 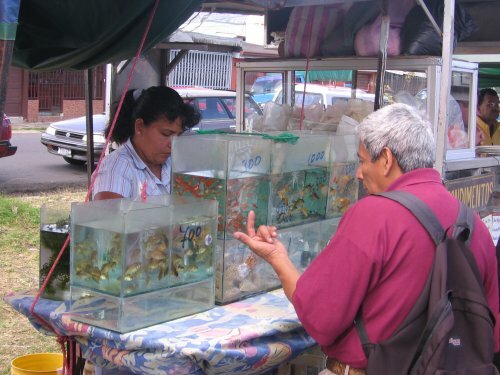 Or even fresher fish as this vendor was selling aquarium fish nearby the fish vendor. Next was the long and winding drive up to the Poas Volcano. 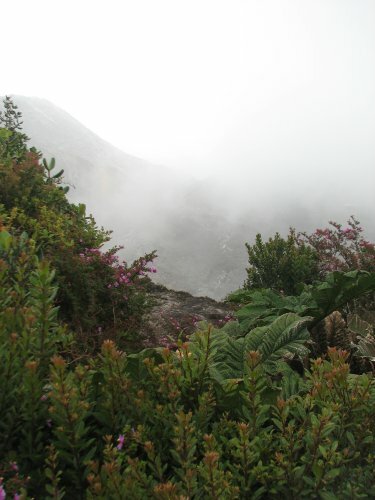 We never saw the volcano as it was shrouded in fog and clouds, but we could smell it, so we know it was really there. 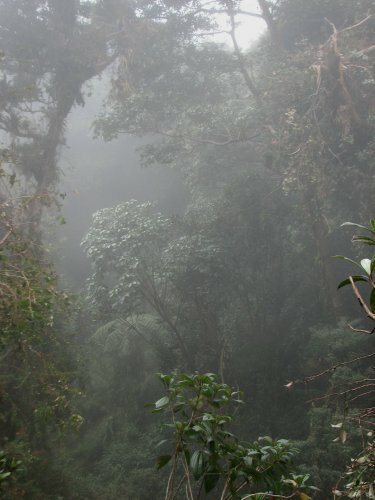 Even though it was disappointing not to see the volcano, we were able to enjoy the trail through a cloud forest at the top of the mountain. 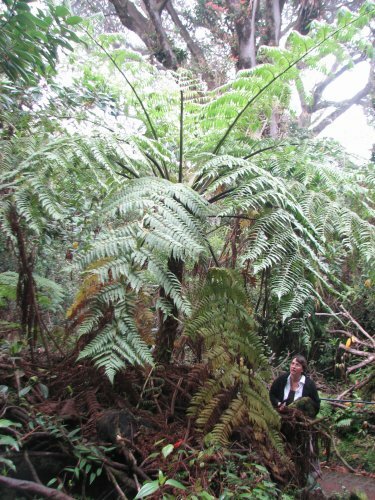 Look for Linda at the base of this massive tree fern! This would make a heck of a floral filler for a Paul Bunyan-esque bouquet! 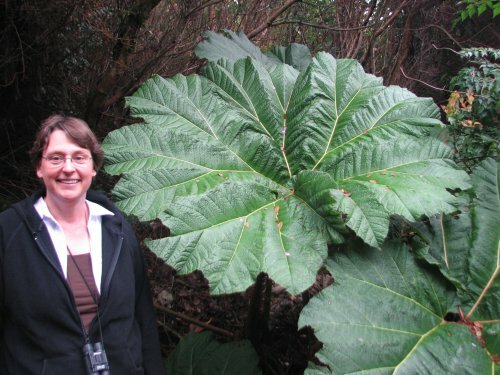 This plant that looks like giant rhubarb leaves is called Poor Man’s Umbrella. Here’s a flower from some jungle flower. 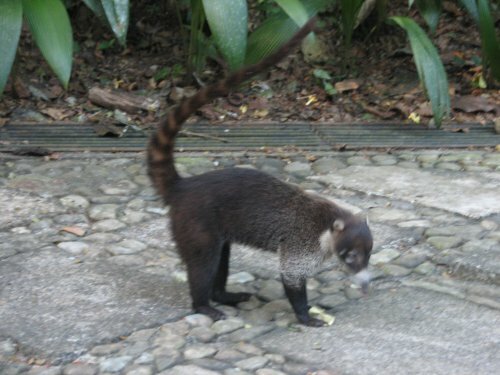 Today we visited InBIO park, kind of a rainforest research theme park in San Jose. Lots of different concepts going on, and I’m not sure it all works together, but it is certainly worth a try. 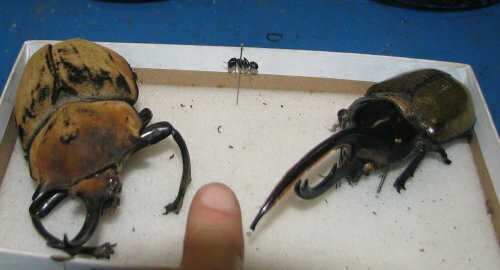 Here are some beetles. They even had samples of the pupae you could look at in jars. 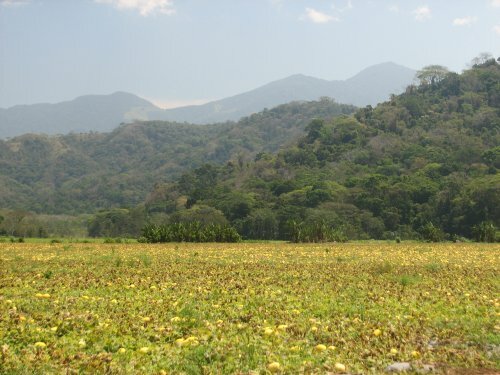 A part of the park’s mission is to catalog all the species in Costa Rica. 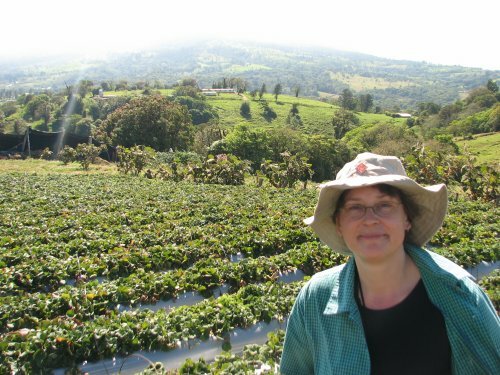 They have scientists collecting plants and insects throughout Costa Rica and keep one sample here and move another sample to their partners in the U.S. including the Missouri Botanical Gardens. 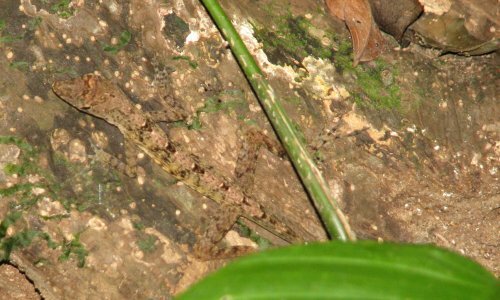 The taxonomists here identify on average of four new species each week! 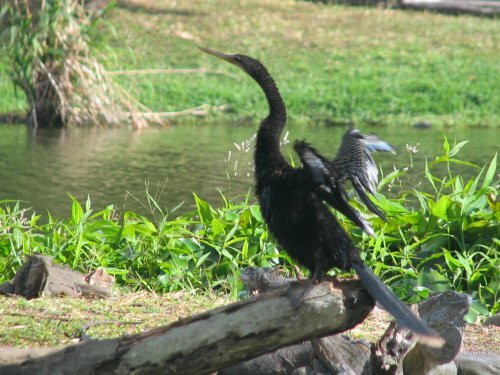 Here is a bird I’ve only seen in my Peterson Field Guide to Birds, the Anhinga. This bird sulks under the surface of the water with only its elongated neck and head out of the water, looking much like a cobra sticking out of the water. Our friend the sloth comes down the tree about once a week. We were lucky enough to spot it while it was descending. 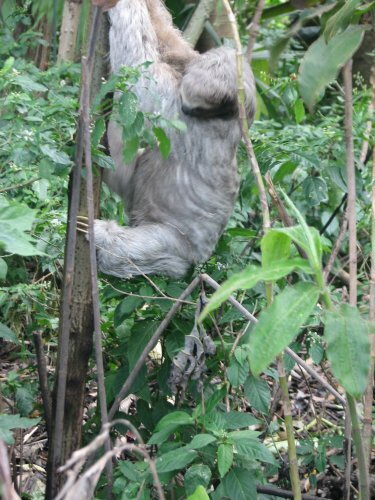 As our interpreter so kindly put it the day before, the sloth is coming down to “dump” – a once a week excursion. 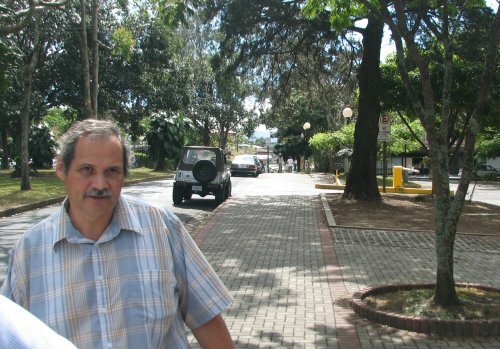 Here is Felipe, one of the arrangers/hosts of the trip and a professor at the University of Costa Rica. The 22 members along on this trip were a diverse lot. 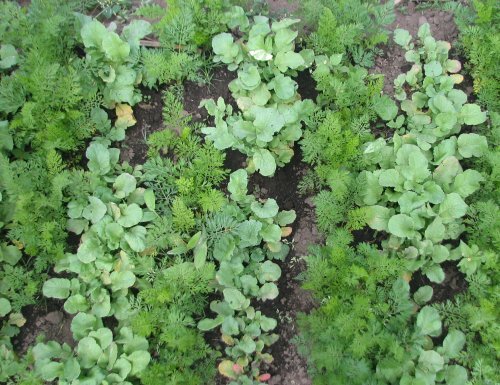 Included were large corn/soybean farmers, extension professors and scientists, small farmers, and a famous state horticulturist and entomologist (if you listen to Iowa Public Radio call-in shows). It was kind of like summer camp all over again – with a lot of together time in the air, on the bus, eating meals, and touring farms. The group jelled well and really seemed to enjoy each other’s company. After a 10 day absence we are back! 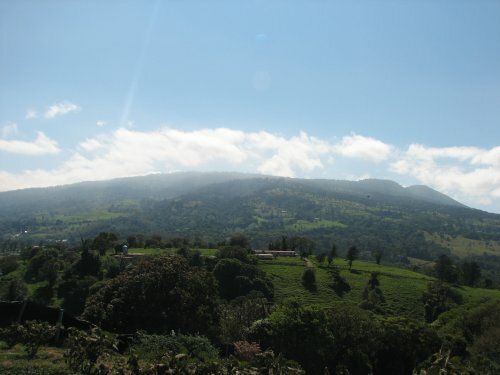 We’ve been in Costa Rica and just returned. 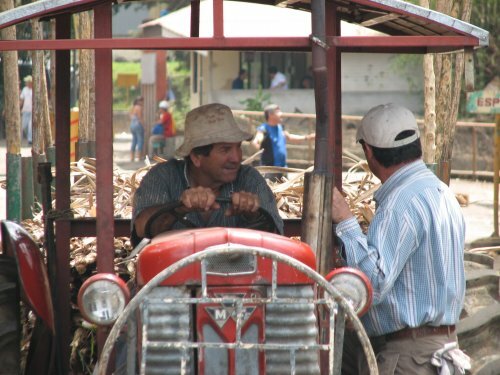 As I get time, I will have about 10 days worth of photos from an agricultural tour of Costa Rica. 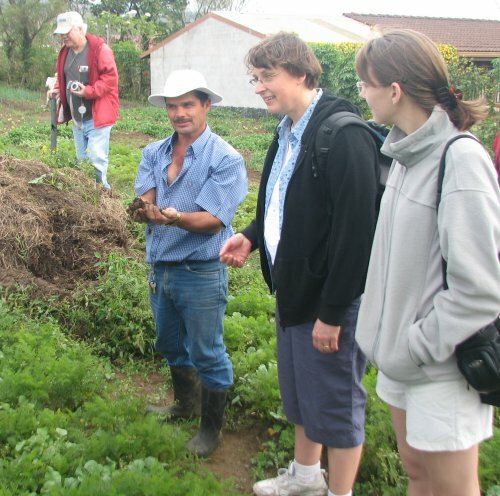 We were invited to trek to Costa Rica by a group at Iowa State that is the beneficiary of a global agriculture grant. 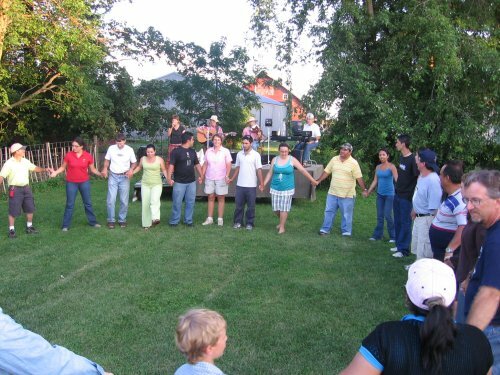 About 22 of us went down to Costa Rica and this summer about 15 or so Ticos (Costa Ricans) will come to Iowa to do likewise. 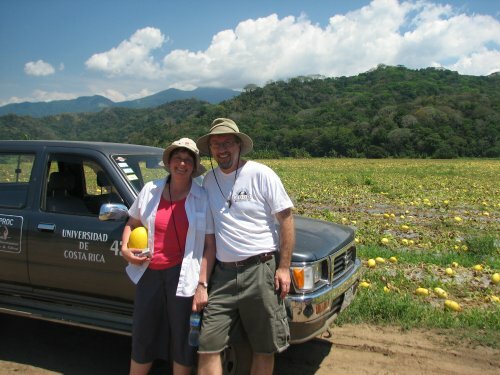 Our hosts were from the University of Costa Rica and they arranged the itinerary that included a variety of farms and lodging as you’ll see in the next few entries. 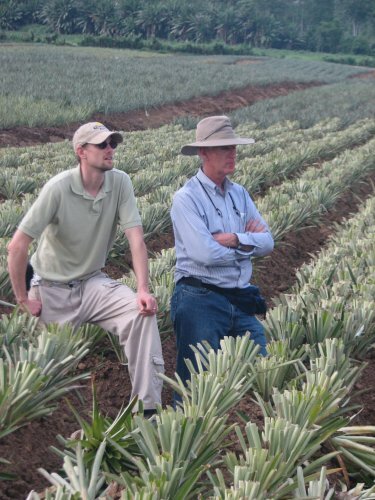 It was a rare chance to get an inside view of tropical agriculture, with great variety – from a small organic farmer high up in the mountains, to a fruit broker recently purchased by Wal-Mart. 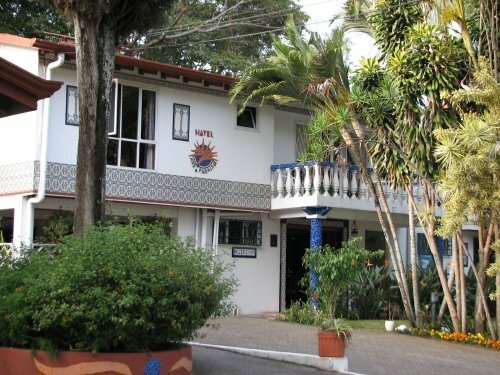 In our introduction to Costa Rica we learned some interesting facts. 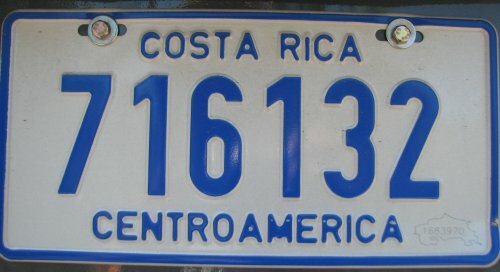 Costa Ricans have a slightly longer life expectancy than the U.S., a nearly equal literacy rate to the U.S., but only 10% of U.S. income. 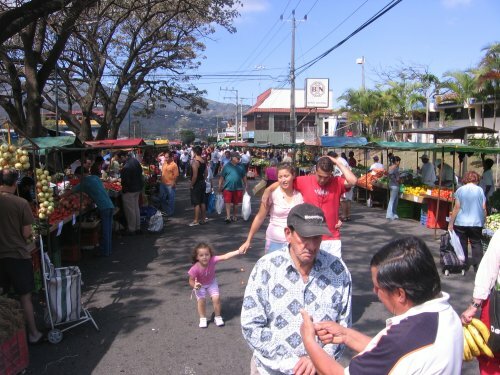 The country has a much higher standard of living than its Central American neighbors and when we asked the presenter why he thought the reason that Costa Rica was so much better off than its neighbors, he said in part, it is because in 1948 Costa Rica abolished the military. In so many cases, Ticos saw Central American countries using military force most often against their own citizens, with frequent civil wars, military coups, and the like. They reasoned that the country was so small, if a big country really wanted to invade, their military would not be able to stop an invasion any way. So, they funneled all the military spending into education, health care, and other services and the result is a country that many immigrants from other countries flock to for work and a chance at a better life.